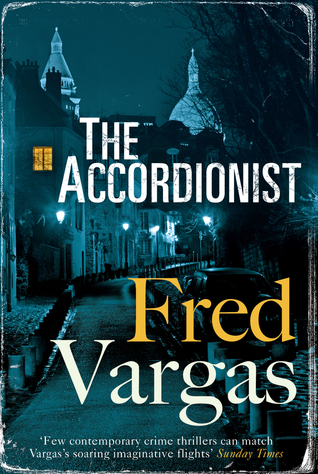 The Accordionist by Fred Vargas and translated by SianReynolds is the third book in the Three Evangelists series and it’s probably the most puzzling of the three. They are quirky crime fiction novels, with eccentric characters and intricate plots. The three ‘Evangelists’ are thirty-something historians, Mathias, Marc and Lucien, all specialists in three different periods of history, who live in a rambling house in Paris. Together with ex-special investigator Louis Kehlweiler, retired from the Ministry of the Interior, they find themselves involved in murder mysteries, mainly because Louis just can’t resist trying to solve particularly difficult crimes. In this third book a simple-minded young man, Clément Vauquer, who plays the accordion, is the prime suspect for the murders of two Parisian women as he was seen watching both of their apartments before their murders. Desperate to prove his innocence he appeals to Marthe, who had looked after him as a child, for help. Louis is supposed to be translating a biography of Bismark, but the newspaper reports of the two murdered women have distracted him so when his old friend Marthe tells him that Clément, who is like a son to her, is innocent and being used as a scapegoat he agrees to investigate and find the real culprit. He in turn, enlists the help of the three evangelists and Marc’s uncle, a retired policeman and they take Clément into their house to protect him whilst they dig deeper into the mystery. I found this book the most baffling of the trilogy and really had no idea of how they managed to unravel all the strands of this murder mystery which has its roots in the past. They worked on instincts and by deciphering Clément’s muddled thoughts and memories, and with the help of a poem by the nineteenth century poet, Gerard de Nerval, finally uncover the killer’s identity. It’s the eccentric characters and the complicated plots that make Fred Vargas’ books stand out for me. Fred Vargas is the pseudonym of of the French historian, archaeologist and writer Frédérique Audoin-Rouzeau. She has won three International Dagger Awards from the Crime Writers Association, for three successive novels: in 2006, 2008 and 2009. I’ve also enjoyed her Commissaire Adamsberg books, probably more even than the Three Evangelists, and I still have a few of that series left to read including the tenth and latest book in the series, This Poison will Remain, due to be published in August this year. I keep saying I will read Vargas and then never seem to get round to it. Thinking back to who first mentioned her to me this has been going on for at least a decade, probably nearer two. I haven’t made any new year’s resolutions but maybe this should be one. I like Vargas’ characters, too, Margaret. That’s what really appeals to me about her work. I’ll admit I like her Commissaire Adamsberg series better, but I agree with you about her characters here. This series intrigues me but I’m not sure about being completely baffled by the mystery. I like a fair chance of being able to figure it out. I read the first one in this series and really enjoyed it so I must get back to it. It was the quirky characters that attracted me, as much as anything else.